Leading Manufacturer of blossom vol-02 designer sharara set, bridal net lehenga choli, designer wedding lehenga, wedding designer lehenga choli, bridal wear lehenga choli and lehenga choli for ladies from Surat. Grab the charming look by draping this collection Fashion & style depends of the attire that you wear, so grab this collection that embraces an alluring color touch. Get the adorable look like never before through this mesmerizing collection. Do Note : Slight Color Varation in actual color vs. image is Possible along with Patch Border work. We are known as the prominent manufacturer of Designer Wedding Lehenga. The offered wedding lehenga is designed utilizing premium grade fabric by our adroit designers in compliance with set market standards. 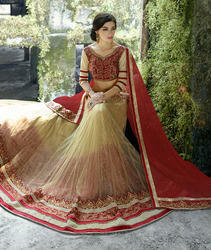 Customers can avail this wedding lehenga from us in customized designs as per their choice. 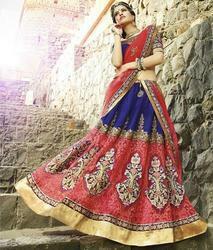 Our wedding lehenga is accessible from us in diverse designs, patterns & colors options. Get the adorable look like never before through this mesmerizing collection. Description: This Classic Designer Wedding bridal lehenga is made up of net lehenga and raw silk blouse with Chiffon Dupatta In heavy patterns and designs .This exclusive Navy Blue lehenga have heavy embroidery with hand work which gives the women an gorgeous look in wedding or party.This lehenga have full embroidery choli(Blouse).